BREMBATE, Italy (BRAIN) — THM Carbones, the high-end German component brand purchased by 3T last year, is eyeing growth in the U.S. market by adding sales, support and fulfillment for the brand through 3T's U.S. operation. 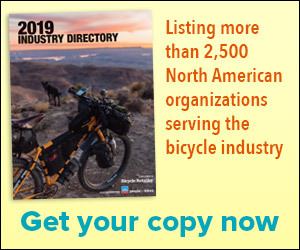 SAN JOSE, Calif. (BRAIN) — BicycleBlueBook has hired longtime Trek sales rep Jeff LaSelle, who will represent the company in seven Southwestern states. LaSelle had been with Trek for 24 years, more recently managing the North Texas and Louisiana territories for the company. GUILFORD, Conn. (BRAIN) — Thomson Bike Tours, one of the largest international bike tour companies, will exclusively provide Canyon Bicycles in its rental fleet next year. The tour operator will use the Canyon Ultimate CF SL 8.0 Di2 models. PORTLAND, Ore. (BRAIN) — Sage Titanium Bicycles has announced the appointment of Sean Kneale as its U.S. sales manager. The Portland-based company offers U.S.-manufactured titanium road, cyclocross and gravel bicycles. The brand's owner and designer is David Rosen. CARLSBAD, Calif. (BRAIN) — Campagnolo North America plans to hold its annual fundraising ride this Saturday, Dec. 2, to benefit Rady's Children's Hospital in San Diego. FORT COLLINS, Colo. (BRAIN) — A Colorado-based investor group has agreed to purchase Niner Bikes. BOSTON (BRAIN) — Velotooler, a peer-to-peer app for bike mechanics, is now offering a program for bike brands needing assembly and deliveries.